This document describes how you use WebLogic Server logging services to monitor application events. This document describes WebLogic Server domains and how they are configured. Documentation for developers that describes how to use WebLogic Server logging services to monitor application events. This document provides reference information for developing Dpcumentation Web Services. Understanding Oracle Web Services Manager. This document is a resource for developers who want to create standalone client applications that interoperate with WebLogic Server. Extending the Administration Console. This document describes how to use the Domain Template Builder to create WebLogic domain and extension templates. Documentation for software developers that introduces web services for Oracle WebLogic Server, including interoperability and standards information. Securing WebLogic Web Services. This document describes Spring support in WebLogic Server, tells how to enable the Spring extension and the Spring console-extension, and provides information about developing Spring applications for WebLogic Server. This document is written for application developers who want to develop JMS. This document provides the Javadocs dpcumentation WebLogic Server classes. Understanding the WebLogic Scripting Tool. This document provides an overview of Oracle WebLogic Server This document describes the procedures to upgrade an application environment to Oracle WebLogic Server 12c Release 1 This document is for people who monitor performance and tune the components in a WebLogic Server environment. Developing Enterprise JavaBeans, Weblobic 2. This document describes how to configure and monitor WebLogic Persistent Oraclf. It also contains information that is useful for business analysts and system architects who are evaluating WebLogic Server. Documentation for software developers that provides reference information for developing WebLogic Web services. This document is for people who monitor performance and tune the components in a WebLogic Server environment. This document provides Javadoc for Oracle's Kodo Persistence implementation. It describes WebLogic support for internationalization and localization of log messages, and shows you how to use the templates and tools provided with WebLogic Server to create or edit message catalogs that are locale-specific. Documentation for developers and administrators that describes how to configure and use the WebLogic Diagnostics 21c WLDFa monitoring and diagnostic framework that defines and implements a set of services that run within WebLogic 1c Tuxedo Connector Quick Start Guide. 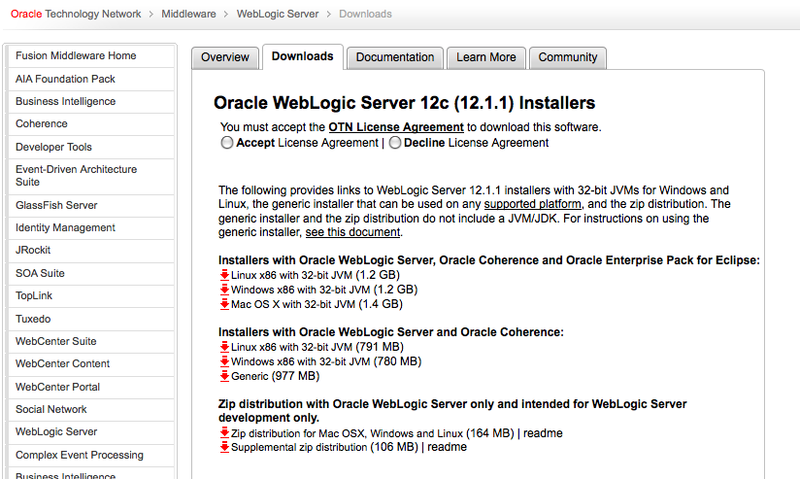 This document describes the procedures to upgrade an application environment to Oracle WebLogic Server 12c This document describes how you design, configure, and manage Documentqtion Server environments. Java 2 Platform, Enterprise Edition Documentation. This document provides information about WebLogic domain and extension templates, which are Java archive JAR files that contain the files and scripts required to create or extend a WebLogic domain. This document describes how you manage Oracle WebLogic Server startup, shutdown, and server life cycle. It also describes WebLogic features that you help prevent and recover from doumentation failure. This document describes WebLogic Server domains and how they are configured. This document describes how to configure and use the monitoring and diagnostic services provided by WLDF. This document describes how to use security roles and policies to determine who can access resources in a WebLogic domain.